At The New York Times, Thomas Edsall ponders Charles Schumer's contention that health care has hurt the Democrats. Exit poll data from 1994, after President Clinton’s failed bid to pass health care reform, as well as from 2010 and 2014, provides further support for the Schumer argument. In each of those three midterm elections there were huge white defections from the Democratic Party; in 2010 and 2014, there were comparable defections of senior voters. The loss of white supporters of House Democratic candidates can be seen in the data. In 1992, white voters split 50-50 between Democratic and Republican House candidates; in 1994, after the Hillarycare debacle, they voted Republican 58-42. By 2010 and 2014, whites voted for Republican House candidates by a 24-point margin, 62-38. The defection of seniors is most striking when comparing exit poll data from 2006 and 2010. In 2006, seniors of all races voted 52-48 for Democratic House candidates; in 2010, they voted 58-42 for Republican House candidates. incomes in the bottom one-fifth of the distribution will increase almost 6 percent; those in the bottom one-tenth of the distribution will rise more than 7 percent. These estimated gains represent averages. Most people already have insurance coverage that will be left largely unaffected by reform. 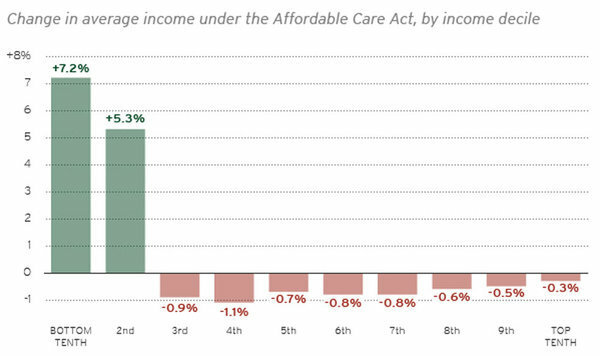 Those who gain subsidized insurance will see bigger percentage gains in their income.